Switching up the styles again, this Hyperdub release features two off-beat, house flavoured dubs driven along by crushed synth piano hooks. The tag team between Kode9 and LD (dub-cutter extraordinaire from the legendary Transition studios in South London) brings percussion and cut-up, filtered female vocals back into the mix. 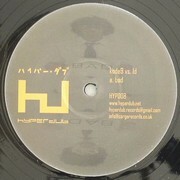 The A-side ‘Bad’ has been circulating on dubplate since the beginning of 2008 and has been a dancefloor friendly favourite from Kode9’s DJ sets. The flip ‘2Bad’ sounds like ‘Bad’s’ little sister, a slower slice of broken house laced with synthetic soul, and that little extra underneath the pavement that you can always expect from Hyperdub.